How often can you have restaurant quality steak? Not often- it’s pretty pricey- but fear not, spatula peeps! We’ll show you how to cook steak in a pan at home that’s restaurant quality, and delicious! 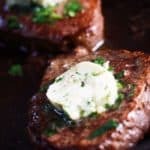 Bonus for all of you keto peeps- this recipe is keto approved! 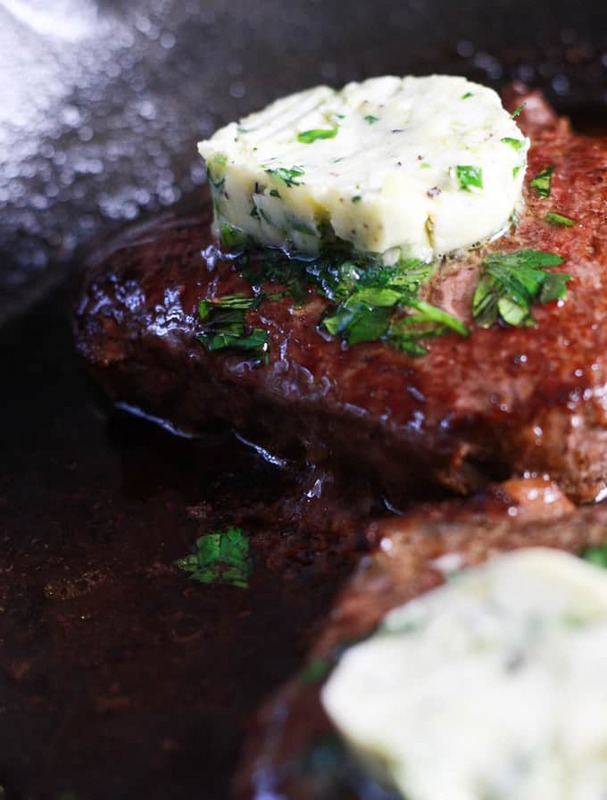 Compound butter and a few other tricks will give you a restaurant quality steak! In my humble opinion, filet mignon’s are the easiest to cook at home, because they’re the most tender. But my Mom loves a ribeye. This recipe is great for all steak cuts! If you need to do some steak reading, check out this article that explains the difference in each cut. It’s pretty informative and will help you when you’re grocery shopping for some beeeefff! Let your beef rest outside the package on the counter for about 30 minutes. This helps the steak sear better, and brings it up in temperature to save some cooking time. The less heat you have to use, the more tender your steak. Once 30 minutes is up, dab your steak with a paper towel to remove excess moisture- this will help caramelize it. 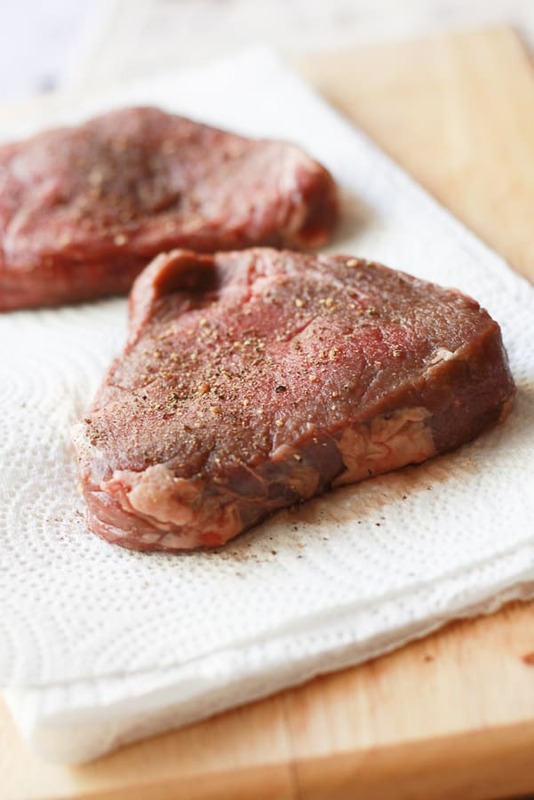 Dry your meat for a better sear! Salt and Peppa make it betta! Next? We’re going to put together some compound butter. You can do this during the 30 minutes your steak sits out so you don’t lose any time. 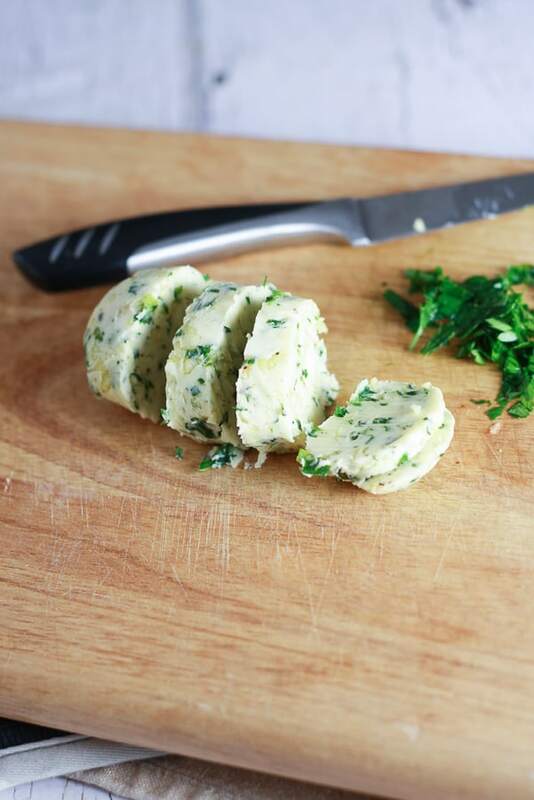 Butter, parsley, garlic, salt and pepper. Mash it up and that’s it! Shmoosh (technical term) your compound butter into a ball in plastic wrap, and refrigerate it until solid. See pic below for what I mean by shmoosh! OKAY- Let’s get back to brass tacks. Steaks. You know what I mean. Heat your pan (cast iron skillets are the best for this- just make sure if you’re using one it’s well seasoned!) on medium high; add 2 tablespoons of plain butter. We’ll save the compound butter for later. Once the 2 tablespoons of butter have melted and the butter is sizzling (NOT smoking- sizzling! If your butter smokes your pan is too hot and you need to redo it- too hot of a pan will majorly screw up your tender steak) go ahead and add your steak to your pan. Sear on each side for 2-4 minutes, or until the inside is 130 degrees (130 degrees is medium rare), or your desired temperature. 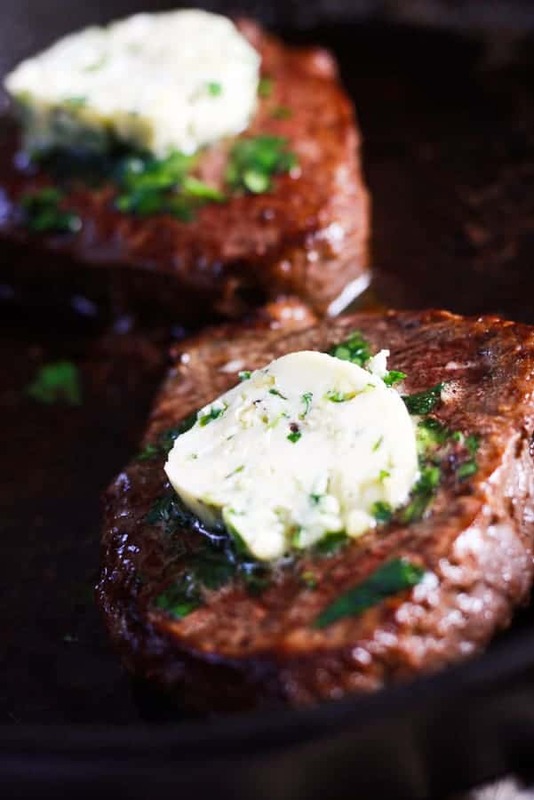 While your steak is cooking, spoon butter on it to keep it moist and delicious. 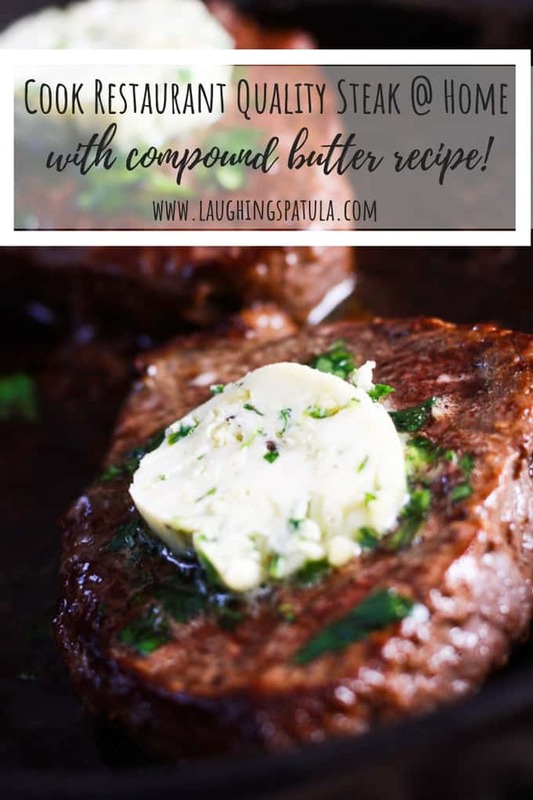 Spoon your butter over your steak while it cooks to keep it tender! Once you’ve reached your desired temperature, slice up that compound butter, put it on top of your steak and you’re good to go! I added some fresh chopped Italian parsley to mine, mostly for color, but it adds some nice flavor also. I served my steak with wedge salads (check out THIS wedge salad platter) with loads of bleu cheese dressing- SO good! If you’re a steak and taters kind of person- check out our creamy slow cooker mashed potatoes. With garlic compound butter, you'll be so glad you learned how to make this! 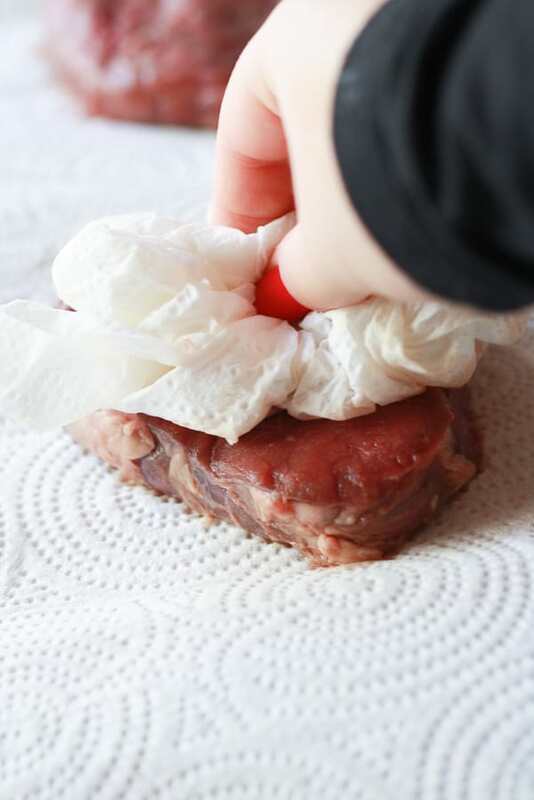 Using a paper towel, remove excess moisture from steak. Mix compound butter; form into long within plastic wrap once fully mixed and refrigerate. Heat cast iron pan to medium-high; melt 2 tablespoons of butter in pan. Once butter is simmering (NOT smoking- don't let it get too hot otherwise your steak will burn!) add steak. Sear 2-3 minute on each side, or until 130 degrees internally. Spoon melted butter over top of steak to keep it moist. Top steak with slice of compound butter & enjoy! In my humble opinion, filet mignon's are the easiest to cook at home,because they're the most tender. If you need to do some steak reading, check out this articlethat explains the difference in each cut. It's pretty informative and will help you when you're grocery shopping for some beeeefff! Let your beef rest outside the package on the counter for about 30 minutes.This helps the steak sear better, and brings it up in temperature to save some cooking time. The less heat you have to use, the more tender your steak. 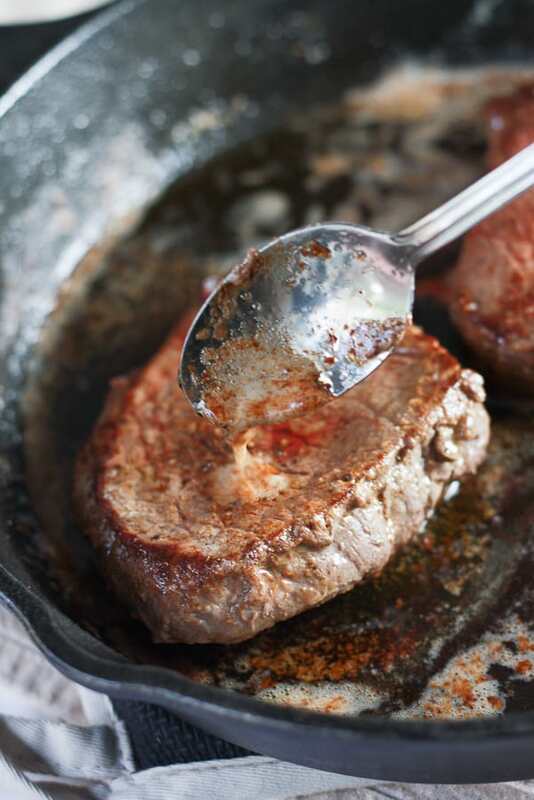 Cast iron pans work fabulous for searing steaks; They really give them a nice crust. I can’t vouch for using other types of pans, but I can’t imagine they would make the steak taste bad- though they might not give it as much of a crust as a cast iron pan would. I served my steak with wedge salads (check out THIS wedge salad platter) with loads of bleu cheese dressing- SO good! 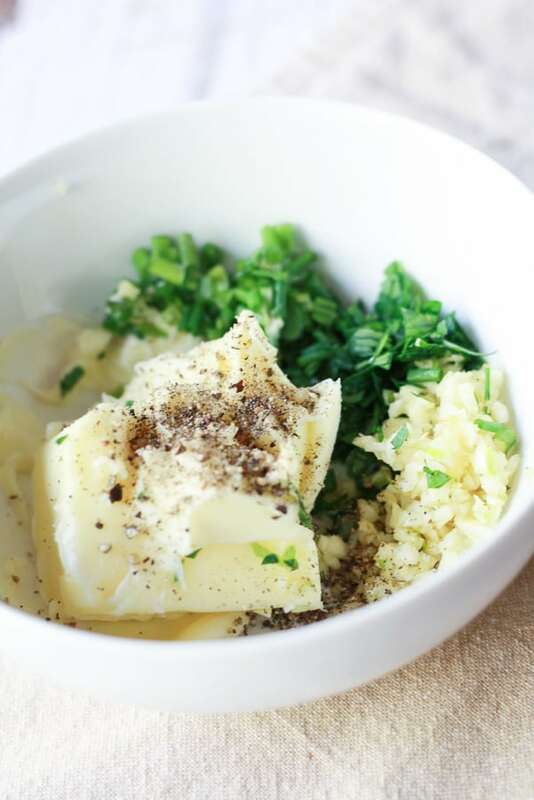 If you're a steak and taters kind of person- check out our creamy slow cooker mashed potatoes. This would be amazing with some mac& cheese on the side.